The Easter Bunny is headed your way in just a few weeks, are you ready? If you still need a basket to fill or a last-minute Easter gift, why not try one of our favorite Top 10 DIY Easter Basket projects? With several baskets to choose from, and all sizes between big to mini treat baskets, you’re sure to find the PERFECT basket to hold all of your Easter treats! 1. Transform a plain old basket into a really awesome ruffled basket with the Ruffled Easter Basket tutorial from Amber at Crazy Little Projects. 2. Vanessa from V and Company shows you step-by-step how to create a coiled Fabric Easter Basket at the Moda Bake Shop. 3. There will be no mistaking who gets this monogrammed basket! Let Amy from Positively Splendid! show you how with her free Fabric Easter Basket Pattern. 4. Create a cute Easter tote to hold treats or for holding your stash at the egg hunt with Chris’s Fabric Easter Basket Tutorial at Pick Up Some Creativity. 5. Sarah’s creative Easter Basket Tutorial literally puts the bunny in the bag! 6. Use up your scraps to stitch up a sweet patchwork bunny basket with this Easter Bunny Basket tutorial from Sewn Up by Teresa Down Under. 7. 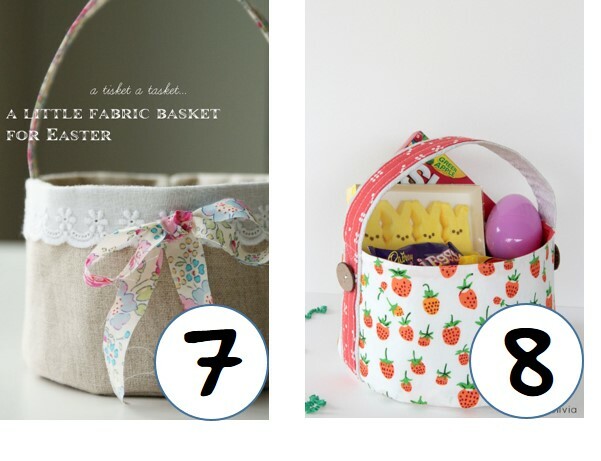 Sew a sweet Little Fabric Basket for Easter with this tutorial from Amy at Nana Company. 8. This fabric basket is perfect for showing off your favorite springtime prints! Get the Soft Fabric Baskets tutorial from Owen’s Olivia. 9. Easy to sew and perfect for little treats, try Ruth’s DIY Felt Monogram Easter Basket tutorial from Living Well Spending Less. 10. Gail from Probably Actually blogs about the cute little bunny treat bags she made using mermag’s Easy Bunny Candy Pouch tutorial. 11. And we just had to add this as an extra, this sweet little Mini Easter Basket treat bags from A Spoonful of Sugar! Next Next post: Sewapalooza! Sew Like a Rock Star!